More info:Price inclusion: Tibet travel permits, Entrance Fees, English-speaking Tibetan local tour guide, 4-star hotel, Transfers, Insurance, airport pick-up and drop-off. Price exclusion: meals, tips to tour guide and driver, single room supplement. Considered to be one of the most important ecological zones, Tibet features abundant resources of glaciers and lakes globally, and many world-renowned rivers originate from it as well. As there are no rubbish and sewage disposal facilities in many isolated regions of Tibet, the fragile natural environment needs to be taken with great care. If travelers carelessly leave pollutants in the wild, the damage to the unspoiled environment would be catastrophic and irreversible. we, being a responsible tour operator in Lhasa, understand how important the coexistence between Tibet tourism and the protection of its natural environment is and always puts environmental protection at a foremost place, doing its utmost to leave no garbage or any pollution to the scenic sites. Trekking in the wilderness, we advocate pollution-free travel and all the plastic rubbish and other pollutants that can't decompose naturally will be packed and carried by yaks to the highway and later get transferred back to cities by tour bus for disposal. We make sure no organic rubbish will be left around camping sites, and things like human waste and food remnant of meal are expected to be buried deep. 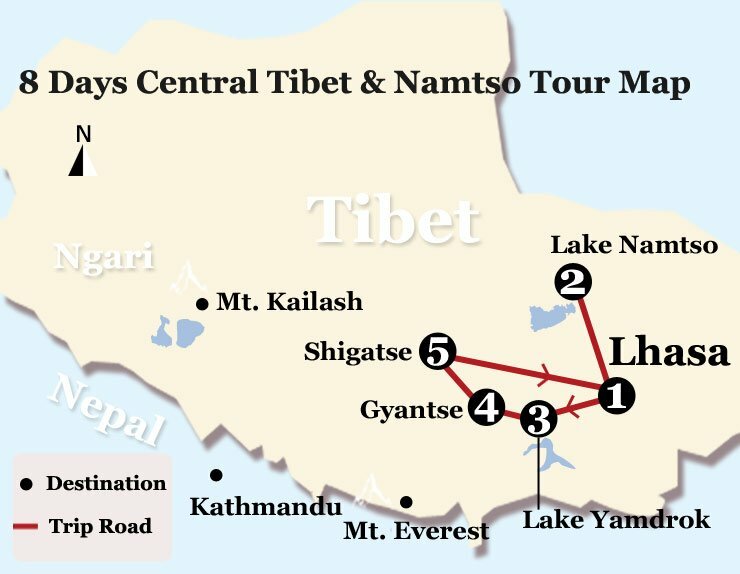 All our tour guides and drivers hired are pure local Tibetans and we provides them with salary, tour allowance, insurance, travel rewards, and opportunities for in-service training and offer necessary help when their family members become sick. Owing to the apparent seasonal change of Tibet travel, so far Tibet Vista has offered 9 months' work to around 40 Tibetan staffs from April to January next year, representing 30 percent higher working months than average in the field. We have been working to train local Tibetans to work in the field of tourism and helping them to master the professional skills to achieve stable and long-term profits and an improved standards of living. Each year from Nov. to March, we offer much training to all the staffs (such as driver, tour guide, employees of hotels) involved in travel service, including tourism management, service skills, treatment of unexpected injuries, first aid to altitude sickness, etc. We give every tourist a guide on how to be a responsible traveler, an initiative created by Tibetan Village Project and Chris Jones for the Tibet Ecotourism Project: an ongoing educational initiative through Columbia University, NYC. This initiative lists basic rules and highlights the social responsibility one has to fulfill so as to be a responsible traveler. Before beginning of tourists' journey, the initiative has been sent to their E-mails and the relevant information has also been posted on our website. We encourage guests to buy locally, to eat in local restaurants and buy handicrafts that are authentic and locally made. We employ local guides and staff who help make guests aware of any cultural values that may differ from their own, for example regarding clothing or the taking of photographs. Tibetans are generally very easy going and may not make it clear if you are behaving inappropriately. Here are a number of things you can easily avoid to ensure your presence is respectful and your interaction with locals will have a positive long-term impact however we let guests know that it is not advisable to buy products made from endangered wildlife or endangered plants; intrude on local people's homes, tents, land or private activities (such as sky burials); swim in holy lakes, sit on holy objects such as mani stones, or walk on or step over prayer flags or create dependency on hand-outs.